I’ve been trying to figure out the best way to document and share my recent Orkney experience. I decided that rather than squeeze thoughts and photos into a post, this might be the better alternative. My intention is to write a piece as often as I can manage, describing, roughly in order, how we got there, what we saw, what we learned. So, these posts will be part travelogue, part archaeology, part natural history, part analysis. I’ve been trying to get to Ireland and the UK for 30 years. Ever since I was a kid, I’ve been drawn to NW European archaeology. In the last decade or so since the internet has made it easier, I have been studying places I wanted to go. One thing I will always try my best to avoid is traveling as a stereotypical tourist or ugly American… I don’t want to be clueless and I want people to know I care about them in the now, not just their history. Especially since social media has made it easy, I’ve been following various on-going excavations across NW Europe. The Ness of Brodgar was one of those. About 7 years ago, I sent an inquiry to the site director about his call out for volunteers. But my kids were small and the timing otherwise poor, and I decided I couldn’t do it. But I kept reading, and following the progress as the Ness excavation grew and continued to astound and redefine our notions of the Neolithic. Then the big article in National Geographic came out in Dec 2014. Since then, the BBC has had several documentaries on the Ness but this past winter, they did a 3-part series that highlighted Orkney archaeology in general. Then I attended a lecture by Nick Card, the director, in Ohio this past March. A couple weeks later, there was an announcement on the Facebook page that several volunteer spots had opened up. I stayed up until 2 am that night, crafting a fresh resume, and sent it. Nick responded the next day, to say I was good to go; the rest is history now. I want to share Orkney with everyone! I do want to go back, and I’d love to go as a guide. If you, or anyone you know, would be interested in going with a small and flexible group, drop me a line! I would really like to take M.A.P. in this direction. North American tours? Ireland? the UK? Let’s do it. Yes, what about Notre Dame? It’s worth some consideration. It does seem to represent a double standard. Irish people had been coming to the New World for centuries along with citizens from the rest of the colonial powers. But from the very beginning, they were usually second-class, not much short of slave standing, bought and sold as much as African-American slaves would be in the future. 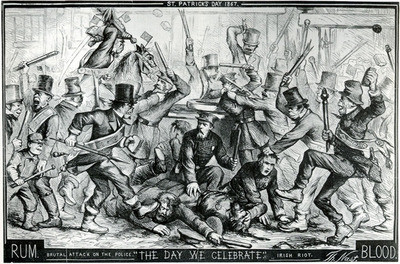 Irish Protestants, descended from English families that occupied Ireland, were not considered to be of the same station as poor, Catholic “indentured servants.” Some were convicts, some orphans, some homeless beggars, forced into servitude to pay off the cost of their involuntary trip to America. Most died either en route, or in just a few short years under extremely harsh colonial masters (see White Cargo for instance). A very few made good. Those are the stories that make it into our history books; the immigrant success story is the only narrative. Irish immigration leveled off as the introduction of the potato made life possible again in marginal Irish lands (where indigenous Irish were being herded into the west ‘to hell or Connaught’). Indeed, poor as they were, the population sky-rocketed after Cromwell’s time. By the mid-1800s, the population had roughly doubled. And then, according to the Protestant English administrators (under Trevelyan), God brought a pestilence to punish the still clannish, traditional Irish for their sins and their Catholicism. People fled to North America en masse. They were not welcome when they arrived. America had been colonized largely by Protestants; Protestantism was the religion of the power structure. They saw the new, immigrant “Famine” Irish the way the English did: brutish, lazy, dirty, superstitious, uneducated and worst of all, Catholic. If they survived the ‘coffin ships’, they were perceived as a plague. Men were signed into the ranks of canal, coal and rail companies at first but in few years, that became signing -straight off the boat- into an army, usually the Union army as the Civil War dragged on. Slums in the cities were death traps of fire, filth and disease. Eventually orphan trains were organized to ship children out of the cities. Irish immigrants were considered the dredges of society- less useful and more socially dangerous than African-American slaves. 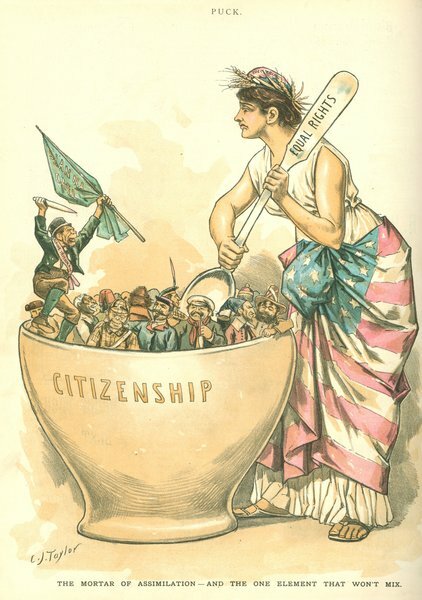 In fact, Irish immigrants were seen as equivalent to, and were politically and economically set against, African-Americans both during and after the Civil War. But the poverty of Irish Catholics didn’t last forever. Survivors of the war made a name for themselves. The ‘Fighting 69th’ became legendary. The Irish retained their clannishness,- banned together, gained wealth and political power and down-played their heritage except when it benefitted them. To greater and lesser degrees depending on their isolation from or inclusion in Irish population enclaves, they reluctantly acculturated. The cost was high. The great trauma and loss endured by immigrants, combined with shame in their heritage, lead to social ills that are still reverberating through Irish-American families to this day. “White Anglo Saxon Protestant” America placed a premium on acculturation- the ‘melting pot’; the good and acceptable immigrants and indigenous people, were the ones who accepted the status quo and blended seamlessly into the whole. Thus the context for Theodore Roosevelt’s “There is no room in this country for hyphenated Americanism,” quote. Those ethnicities that resisted acculturation faced severe discrimination, and still do. In the decades surrounding the turn of the century, Catholics settled the mid-west and tended to form Catholic communities and institutions, and were of course attracted to existing ones, like Notre Dame. There were wealthy Irish Catholics now, but they were still trying to live down the Irish reputation. They began to co-opt, to positively spin, some of the stereotypical characteristics attributed to them, as evidenced in the historic Notre Dame quote above. Pugnacity, tenacity, hardiness, bravery, intensity, and love of language, and story-telling. Now, you can see that it wouldn’t be possible for Notre Dame to accept such a moniker until that had really begun to take hold and everyone- even the Irish- had begun to romanticize their history. Notre Dame took on the name ‘Fighting Irish’ in 1927. Consider the evolution of the Kennedy family over the decades, through the Depression, WWII, the beginning of the Cold War, Korea… in 1960 Notre Dame cheerleaders moved from the tradition of using a series of Irish terriers as mascots by adding a student dressed as a leprechaun to their activities. A sports artist named Theodore Drake developed the leprechaun logo in 1964 (for $50!). In 1965, the leprechaun became the official mascot. Shouldn’t that be a pestle? Wait, pestles are for crushing- not quite what the artist intended. So, spoon it is. It doesn’t take long to find Irish people who are annoyed by what they call ‘begosh and begorrah” Irish, often American, that clothe themselves in stereotypical Irish American commercialism, and sayings. Leprechauns have for decades been part of that commercialism. These days, it’s bumper stickers, clothing and drinking paraphernalia that abounds in America with all sorts of culturally degrading ethnic images and language, that prominently feature leprechauns- even the Notre Dame version. 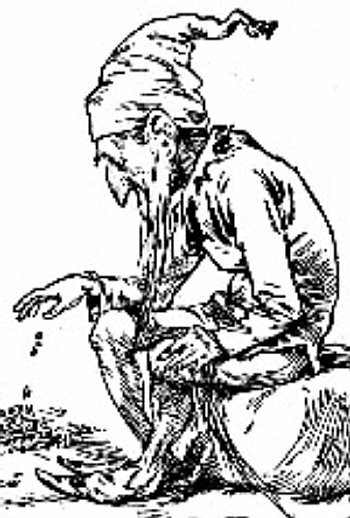 In America, leprechauns have slowly morphed into an Irish identifier. They are not in Ireland. Now, let’s take a look at images the logo leprechaun is based on. 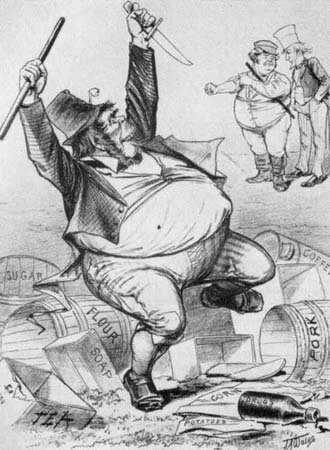 Many images to be found on the internet are by cartoonist Thomas Nast. 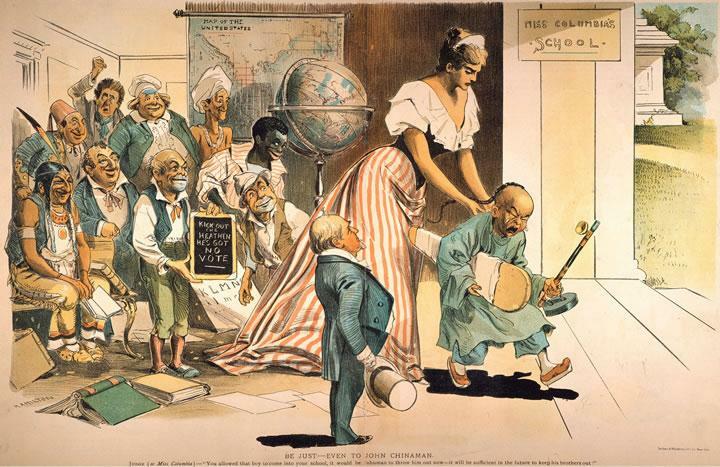 Some apologists argue Nast’s racism may be mitigated in that it was normalized satirical methodology for the era, and that he was aiming his vitriol at certain segments of the Irish community for admittedly shady shenanigans surrounding the Tammany Hall political machine. 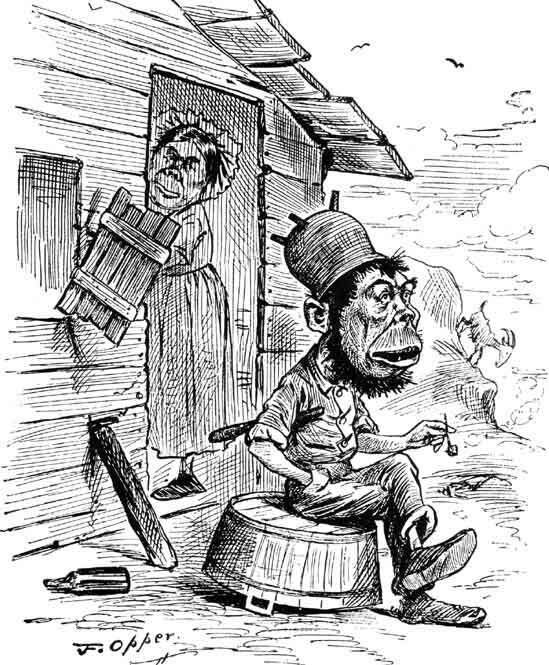 Regardless, his opinion of Irish Catholics and those unwilling to assimilate is clear in his and many other cartoonist’s portrayals of them as apes: slovenly, drunken, lazy, brawling, brutish. It’s hard to miss the Notre Dame logo’s resemblance to these early illustrations. While I realize Mr. Drake the logo artist wasn’t intentionally being racist, I think it can be concluded he was drawing on a century of media depictions of Irishmen. The point is, this image and it’s updates since 1964, are both a product of, and perpetuation of stereotypes, many negative, and at best misleading. 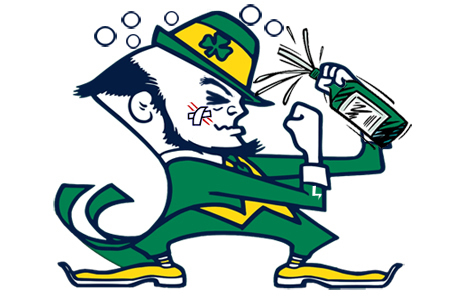 The Notre Dame logo doesn’t so much resemble a leprechaun, as it resembles 19th century stereotypes. First Notre Dame leprechaun logo, by sports artist Theodore Drake, c. 1964. I can see people still shaking heads. Satire helps sometimes. I would propose Notre Dame keep the “Fighting Irish” cognomen to honor the Irish “never-say-die” spirit and Irish veterans, but retire the leprechaun logo. An idea might be to replace in with the block letters, or perhaps with the permission of the Irish government, the harp symbol. The leprechaun belongs, with Chief Wahoo and the Brave’s Chief Noc-a-homa, among others, in the dustbin of history. For thousands of years, the river cut it’s way through the upland plains in the land south of the Lakes. The river joined smaller brothers as it wound around rises, as it fell down shallow slopes to eventually join it’s own bigger brother. In one place, the river did something it almost never did. It took a sharp turn north, against it’s generally southwestward flow. Once, it hadn’t followed this tortuous northern bend. It had flowed easily along the base of a cliff it been carving out for millennia until the earth pushed it away and urged it to take a new path. Now it flowed on the other side of the valley, carving new cliffs, and a wide plain within the Great Bend. The river loved the animals, and when humans came the river loved them especially because they knew the river, and talked to it and gave it a name. And the river gave the humans many gifts. For many long years the river saw humans come to the Great Bend, where the river flowed north, where the great herds migrated and where finally, humans made encampments. They bore their young there, like the other animals. They lived and collected the many foodstuffs that lived and grew on the floodplain, and river and bog. Eventually the river saw the humans make shelters that lasted many seasons, not just the little shelters that they carried or ones that rotted away quickly. The humans burned the grasses and trees and planted new ones. They rode the river in trees and the skins of trees. They fished in the river and gathered clay by the river. They dug holes in the earth and placed food inside, or refuse, or fires or sometimes, their dead. And the river watched. Then, new humans came that were different and many. They used the river differently, and they tore down the trees and wrenched great furrows into the ground. The rains came and carried much soil from the furrows into the river. And the river, once named for it’s clear water and stony bottom became muddy, and sluggish. Many of the creatures that lived in the river struggled to survive as they suffocated in silt and were over-harvested by the new humans. The new humans dumped poisonous things into the river, that didn’t rot away. They didn’t talk to the river. And the river watched. Even later, in the Great Bend, one new human decided to cut the river off from the land. He used machines to tear apart the earth. He used the earth to make a wall and force the river to stay always in it’s banks. But the river liked to stretch sometimes. Sometimes it was swollen with snowmelt and rain from the thunder clouds. The river gave soil to the land at these times, and the land was always grateful and glad of the gift of the river. The river was angry and roiled against the wall and slowly, season by season, it began to break the wall down. And still the river watched. When the old wall-builder died, his bones were not buried near the river. The river saw new humans come to the Great Bend. The new humans were different from all that had come before. They walked and listened and talked. They built slowly, and planted the old plants and the river was glad. The river broke through the wall in one place and the new humans only watched, and the river sighed with relief. The new humans began to ride the river again, and take away the poisonous things. The river was happier than it had been in a long time. But then the new humans began to dig again. And the river saw the digging where the old ones dwelled long ago. Every fall, for 12 seasons, the river saw the bones of the old ones being uncovered, exposed and sometimes carried away. The things the old ones made with the gifts of the river- shell, rock, clay – were torn from the land and carried away. The old ones who had talked to the river, and named it, and who had never harmed it. And the river was sad and angry at the new ones, and tore up the trails they laid near the river. And the river watched. One day, the river felt a something it hadn’t felt in a long time. The river watched some humans come to the Great Bend, to the places where the old ones had dwelled. They looked a little like the new ones but they felt different. And familiar. The river watched and was curious. These humans were quiet and sad. They looked at the land and the plants and the river. They talked to them. And the river knew they were from the old ones. And the river watched. Summer grew old and fall was drawing near again. The river waited for the diggers to come to the Great Bend, but no diggers came. The river rejoiced. But now, it misses the old ones. The river waits and watches for the old ones to come again.